Military and overseas citizens are provided with special procedures and protections under federal and state law to help them overcome barriers to voter registration and voting caused by their military service or residence overseas. Military and overseas citizens are also referred to as "UOCAVA" voters. 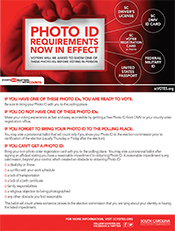 UOCAVA stands for the Uniformed and Overseas Citizens Absentee Voting Act (UOCAVA), the primary federal legislation that establishes these special rules. What is the easiest way to vote as a UOCAVA voter? EVAT allows UOCAVA voters to upload their Federal Post Card Application (FPCA), get their ballot, mark their ballot, and print their ballot. The voter then returns their ballot by mail, fax, or email. How do I become a UOCAVA voter? Submit a Federal Post Card Application (FPCA). 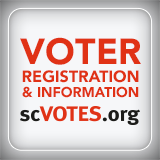 This will both register you to vote (if not already registered) and designate you as a UOCAVA voter. The Electronic Voting Accessibility Tool (see above) will guide you through the process of completing and submitting your FPCA online. 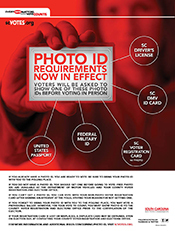 You can also get an FPCA from the Federal Voting Assistance Program website (FVAP.gov) and return it to your county elections office by mail, fax or email. 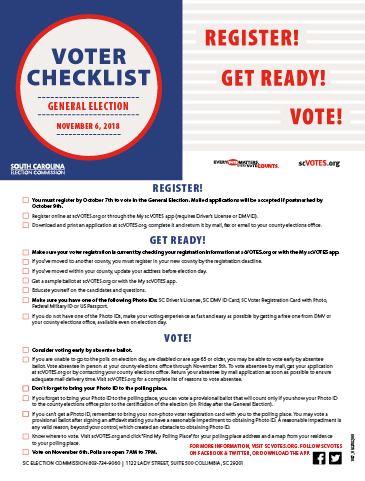 If you're using the FPCA to register to vote, it must be submitted by the voter registration deadline to participate in any particular election. You can also become a UOCAVA voter by submitting a state absentee application checking one of the qualifying reasons on the application. If you use the state application, you must first be registered to vote. The deadline for any voter to submit a voter registration application is the 31st day prior to any election in which you wish to vote. A mailed application must be postmarked by the deadline. Faxed, emailed, or personally delivered applications must be received by the deadline. 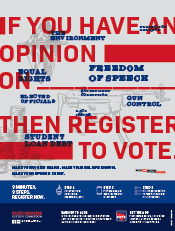 If you're using an FPCA to register to vote, you must meet the deadline. What is the deadline to return my absentee application? UOCAVA voters can submit an FPCA, FWAB (see below), or state absentee application on any day leading up to, and including, the day of the election in which you wish to vote. Be sure to leave yourself time to return the ballot by no later than 7:00 p.m. Eastern Time on the day of the election (see "What is the deadline to return my ballot?" below). How long will my UOCAVA status last? Once you submit an absentee application indicating your UOCAVA status, you will remain a UOCAVA voter through December 31 of the following year. You can request your UOCAVA status end on any sooner date. If you want to remain a UOCAVA voter at the end of the period, you must submit a new FPCA or state application. How do I get my ballot? As long as your UOCAVA status is in effect, your county election office will send you a ballot through your preferred choice of communication no later than 45 days prior to any election in which you are eligible to vote. Indicate on your FPCA your preferred method of communication with your county elections office. Your preferred method of communication can be mail, fax or email. If you use the Electronic Voting Accessibility Tool (EVAT), you are opting to receive your ballot online. Return your ballot by email, mail, fax or return it in person. Click here for your county elections office contact information. Your county elections office will send specific instructions with your ballot on how it should be returned. If you are mailing your ballot, be sure to sign the voter's oath on the return envelope and mail the ballot as soon as possible and no later than 7:00 p.m. Eastern Time on the day of the election. If you are returning your ballot my email, fax, or personal delivery, your ballot must be returned to the office no later than 7:00 p.m. Eastern Time on the day of the election. If you are returning your ballot by mail, you must mail your ballot no later than 7:00 p.m. Eastern Time on the day of the election. How do I know if my ballot has been sent or received? How do I know if my UOCAVA ballot was counted? First, check to see if your ballot was received by the deadline (use link above). NOTE: If you returned your ballot by mail it will be counted as long as it was received by 7:00 p.m. on the day after a primary or two days after an election. Second, check here to see if your ballot was challenged for any reason and whether it was counted. Ballots aren't available, but I need to vote now. What do I do? You can use the Federal Write-in Absentee Ballot (FWAB) available at FVAP.gov. The FVAP.gov online assistant will guide you through completing your FWAB. The FWAB online assistant will list only federal offices and candidates if available. The FWAB has no state or local offices or candidates listed on the ballot. You will need to write in the office and the candidate of your choice. If you don't want to use the FWAB online assistant, print a FWAB here and complete it by hand. 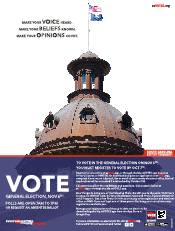 Find out which offices and candidates are up for election using the Online Sample Ballot. Online sample ballot is available 100 days prior to any election. Only offices (no candidates) will be listed initially. Candidates are usually available around 60 days before an election and no later than 45 days before an election. Write the name of the office or ballot question in the blank provided. Then write the name of your candidate of choice or answer to the question in the blank provided. IRV ballots are used only in primaries. All UOCAVA voters receive an IRV ballot with their primary ballot. IRV ballots allow UOCAVA voters to rank the primary candidates and serves as the voter's ballot in the event of a runoff. The highest ranked candidate of the two remaining will receive the voter's vote in the runoff. IRV ballots feature only those offices with three or more candidates. There is no chance for a runoff in offices with only two candidates. A candidate must receive more than 50% of the vote to win a primary. If no candidate receives more than 50% of the vote, a runoff is held two weeks later between the top two candidates. Two weeks may not be enough time for UOCAVA voters to receive and return a traditional absentee ballot. IRV is designed to solve this problem. County voter registration office mailing address, telephone number, fax number, and e-mail address. Check your absentee ballot status.